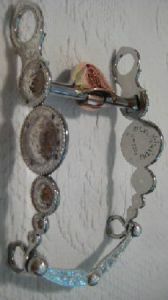 Stainless Steel with Silver Overlay bit with five conchos forming the cheeks. Notice that the conchos have a Silver Rope Edge which makes this bit more beautiful. Here the bit is pictured with a Low Port Salinas (MP-07) mouthpiece which has copper roller and hood but no tongue relief and bit ends with a bar.